In May, Fortune published its annual “Fortune 500” issue devoted to America’s largest corporations. It’s full of reports on huge companies, billion-dollar legal battles, and supremely confident executives who talk a good game and dress even better. In other words, it is an issue that revels in power–who’s gaining it, who’s losing it, who’s using it to make money or lose money. The issue contains all kinds of well-crafted articles, yet as a whole seems strangely beside the point. Whether it’s painfully staged photos of the boards of directors of Waste Management or the Business Roundtable, or a what-if essay on Stan O’Neal’s unsuccessful effort to sell Merrill Lynch before the financial meltdown–The world of the rich and powerful celebrated in those pages seems weirdly out-of-sync with the fast-moving, uncertain, thrilling-and-terrifying world in which most of us spend our days. These folks all come off as a little, well, overrated. That’s what makes another development this month so promising. Professor Gary Hamel, one of the most prolific authors in HBR history, working with a founding team that includes Polly LaBarre, one of my go-to colleagues at Fast Company and my coauthor on Mavericks at Work, have launched an online platform called MIX–Management Innovation eXchange–designed to unleash, attract, and highlight ideas from all sorts of people, in all kinds of organizations, in every part of the world, that can help reinvent the work of management itself–or, in their words, “the technology of human accomplishment.” Who better to write a new agenda for business than the grassroots leaders who are getting things done every day? Today, for most of us, those noble goals and big dreams are just that. They don’t have much to do with the day-to-day realities inside most real-world organizations. But we’ve all encountered organizations, we’ve all spent time with leaders in various walks of life, who are making a difference by working differently, who are creating lasting value based on the values they bring to their work, and who are determined to share the wealth their organizations create. The folks at MIX are eager for these grassroots innovators to (ahem) throw their ideas into the mix, and, thus, individually and collectively, help shape a new and more human agenda for competition, business, and leadership. 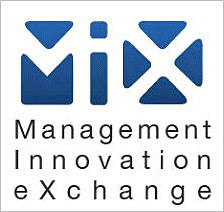 Alan Kay, the celebrated computer scientist, put it memorably nearly 40 years ago: “The best way to predict the future is to invent it.” Here’s hoping the launch of MIX can unleash a worldwide explosion of new ideas, clever techniques, and case studies that advances the state of management–and spreads more freedom to people on the front lines of business organizations around the world.